The expansive new Hardywood West Creek in Goochland is spacious, yet warm and inviting. My description of Hardywood Park Craft Brewery’s new production facility and tasting room in Goochland County may come across more like a marketing piece than the observations of an outside observer. It’s just that appealing. I got my chance to see it at the ribbon-cutting ceremony on Jan. 8. From the outside, the expansive building is reminiscent of a barn: cedar siding with splashes of rich, red-barn color. Given beer’s agricultural base and Hardywood’s emphasis on using local ingredients and vendors, the allusion makes sense. The wide-open interior shows off cedar paneling on the walls and a pine ceiling two tall stories above; iron beams; windows and skylights providing generous natural light; and a mezzanine and second-story bar and tasting area. The 4,000-square-foot taproom offers views of the 55,000-square-foot brewery with a state-of-the-art 60-barrel BrauKon brewing system. It’s all spacious, yet warm and inviting. Appropriately, the semicircular bar topped with corrugated aluminum calls to mind a grain silo. Tap handles (two dozen at the downstairs bar alone) and tasting room furniture were made from trees felled on the West Creek property. The décor I’m gushing over easily outshines that of most craft breweries, including Hardywood’s original Ownby Street building. But that’s because most breweries are, of necessity, established in existing buildings created and zoned for industrial use (hence drawing on a rather drab slate to begin with). Not so here. Co-owners Eric McKay and Patrick Murtaugh and their team designed the Goochland facilities from scratch on a 24-acre wooded lot overlooking Tuckahoe Creek. At the Jan. 8 ceremony, McKay and Murtaugh were joined by outgoing Gov. Terry McAuliffe and outgoing Secretary of Commerce and Trade Todd Haymore - an appropriate swan song, given all of the support the Gov. McAuliffe and Secretary Haymore have provided for Virginia breweries during the craft beer governor’s four years in office. He and McKay cited a generous laundry list of those who have helped contribute to their success, including many local vendors. Nelson expects to begin brewing by late February. The West Creek brewery will be dedicated to the flagship beers—Singel, Pils and VIPA—plus the Virginia Roots series, brewed with Virginia ingredients. 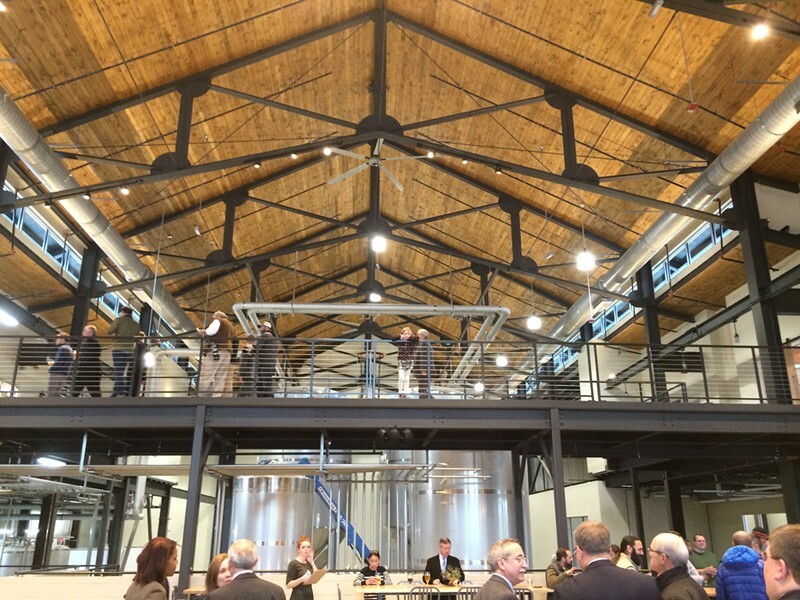 The tasting room will open to the public in February, beginning with beers from the Richmond production facility. The brewery’s 2,000-square-foot patio overlooking the creek will be especially popular come spring. In the works are a food truck plaza, bocce courts, a natural amphitheater for live performances and a trail system. The large venue will host festivals and indoor and outdoor concerts. Space is also available for adding brewing equipment once Hardywood again reaches capacity. The grand opening weekend is scheduled for April 6-8. It is located at 810 Sanctuary Trail Drive (or for GPS users) 200 yards to the West of Virginia Farm Bureau located at 12580 West Creek Parkway, Richmond, Virginia, 23238.